cinnamon dolce baked french toast | omfg. so good. I feel like I talk about Starbucks a lot during the winter months. I can’t help it though. They come out with some of the greatest stuff for the season. One of my all-time favorite indulgences is the Cinnamon Dolce Latte. It literally tastes like someone threw a few slices of cinnamon french toast into a blender with some whipped cream and a shot of espresso. 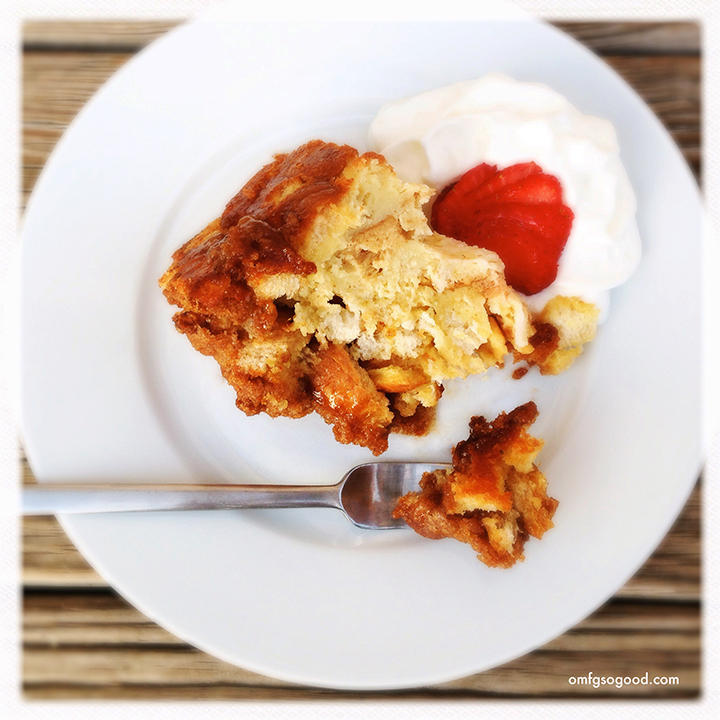 Oven Baked French Toast (aka, French Toast Casserole) is also one of my all-time favorite indulgences. It makes an amazing Christmas morning breakfast, or an even more amazing Christmas Eve “breakfast for dinner”, with a few pieces of perfectly crisped bacon. And maybe a Hot Buttered Rum. I feel like everyone has their own recipe for Oven Baked French Toast. So what makes mine so la-dee-dah? Maybe a hit of espresso powder in the custard blend. 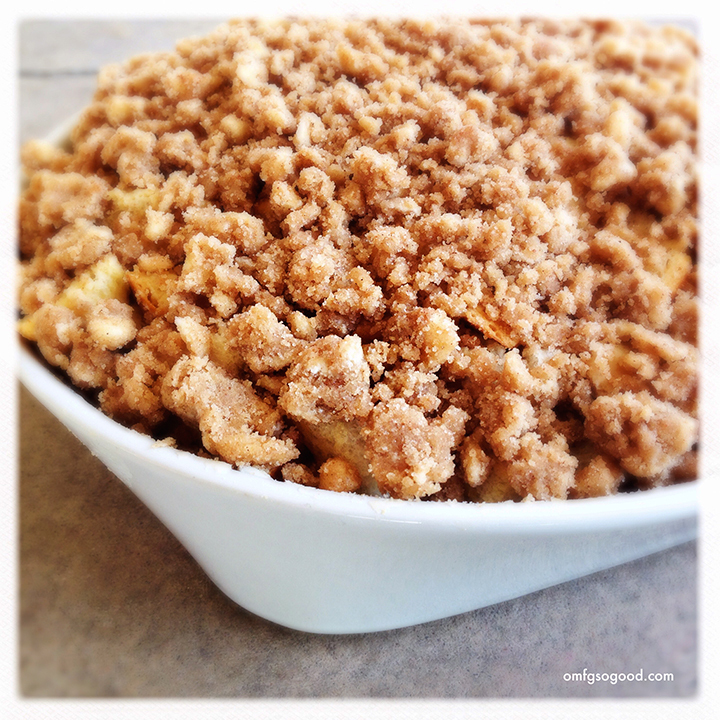 Oh, and the cinnamon streusel topping that creates a perfectly sweet, spiced, caramelized crust. No need for syrup. Maybe just a nip of whipped cream, and a few fresh berries. You know, so it’s somewhat healthy. Let me preface by saying, it’s best to prepare this the night before you plan on eating it so the custard has plenty of time to absorb into the bread. Trust me, it’s your non-stop ticket to Flavortown, my friend. And on that note, let’s do this. To make the custard, whisk the eggs in a large bowl until they’re a nice light yellow, then add the cream, milk, espresso powder, cinnamon, vanilla and sugar. Whisk to combine and slightly dissolve the sugar. To make the topping, toss the cold butter cubes in a mixing bowl and add the flour, brown sugar, pecans, cinnamon and salt. 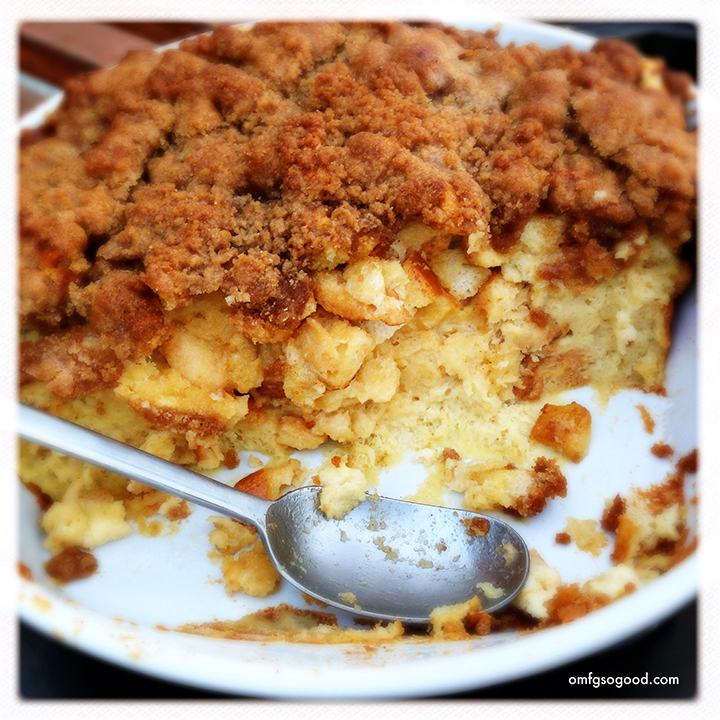 Use a pastry cutter (or your clean fingers) and work the ingredients into a nice crumbly texture. You can prepare this ahead of time and store it in a ziplock bag in the fridge until you’re ready to bake the french toast. This really is a good substitute for standard french toast on a special occasion. Especially if you’re trying to impress your new brother-in-law. Right, Eric and Adrienne? You might even be able to get away with giving something really lame, like tube socks or a flash light, if you feed him some of this before opening presents. Although, if you try that, don’t tell him it was my idea.